There is perhaps no better time to appeal to people for fundraising than during the Christmas season, when there are throngs of shoppers in town centres, eager to purchase gifts for their loved ones. Christmas imparts this feeling of charity and giving, making it an ideal time to collect charitable donations. People do more shopping at Christmas than at any other time of year, making it an ideal opportunity to sell items for your fundraising cause. Christmas items are especially popular, so get creative! Homemade Christmas cookies - Santa isn't the only one who loves cookies and milk. 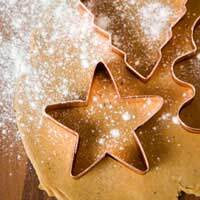 Spend the day baking and packaging homemade Christmas cakes and cookies, which can be sold on to friends, family and coworkers with a profit for your fundraising. Christmas cards - Christmas cards are easy to make and sell, and with most households sending Christmas cards to their friends and family, the opportunities for fundraising success are nearly limitless. Handmade Christmas decorations - If you're handy with art supplies, there are a variety of Christmas decorations you can create and sell, such as tree baubles, wreaths and garland strands. Even if you're not very good at crafts, you can offer to help neighbours put up their decorations in exchange for a donation. In addition to selling Christmas items and appealing for donations from your neighbours, friends and family, you can also get out into your community and fundraise. Ask a local supermarket if you can pack grocery bags at the checkout stands. People will be glad for the assistance with their Christmas shop, and they'll give you a donation in exchange for your help. You can even stand several volunteers outside the shop and offer assistance with carrying bags out to shoppers' cars. To really get the Christmas spirit into your community, ask your local authority for permission to sing carols in the town centre. Don't forget to recruit at least one volunteer to move amongst the onlookers and take donations while you sing! There's no better time of the year to donate to charity, and charity begins at home. Even if you don't want to sing or sell your way to Christmas fundraising success, there are several ways you can change your current Christmas routine and immediately make a difference for your fundraising efforts. First, ask your friends and family for a donation instead of a Christmas gift. You may initially meet with resistance, but if you explain that this is what you truly want for the holiday season, many will oblige your request. You can also ask for donations by including a note inside the Christmas cards you mail to friends and family. Even if they are not able to donate immediately, you have at least spread the word about your cause and your fundraising efforts. No matter what fundraising ideas you do this Christmas season, your ideas will help to remind those around you of the true spirit and meaning of Christmas, helping to brighten the holidays for you, your family and friends, and your fundraising cause.